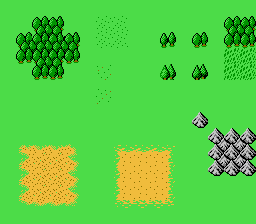 I needed a break last week, so I dusted off my idea to make an NES RPG and tried making some of the art. I would like some honest feedback. Rip in to them. Be critical. Hurt my feelings. These are not exactly considered "final," and so I've got a couple different versions of most elements in this image. Some slight variations for the trees, two different ideas for the desert/sand, and the grass might be solid or use dots. Hell I'm not even sure about the color for the grass and have a couple other versions for that. Looks very good to me. I'd use faint dots or even small grass tuffets for the grass to look more lively. Dragon Quest and Final Fantasy uses $29 and $1A for grass and trees, and FF additionally uses $19 on trees. DQ uses $27 for tree stems and $37 for desert and hills. Also, DQ uses $11 for both water and sky (in battle backdrops), while FF uses $21 and $31 for the sea and $2C for streams. As for the characters, the men looks good but the women has quite plain hairstyles. I'd add some pigtails or something. Thank you; I am aware of what they used. I've been looking at a lot of examples, really. But the problem is finding color combinations that work well with the art. If i'm using two tones of green, how much I have of one versus the other, or what patterns I have with them, or how much black is in the tile... They all change the effect, so it comes down to what looks good with *my* tiles, and possibly how I can tweak my tiles to look better with the given colors. These are *really* nice, man! 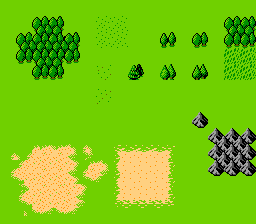 A step above most overworld tiles on the NES, but they look like they'd fit right in on any JPRG. Flexible too, seeing as how these tiles work in many color schemes. As someone who is normally very picky about pixel art, I'd have no qualms playing a game with these graphics. Not an improvement so much as a different direction you could take this. When it comes to low-color art, I'm rather fond of the chiaroscuro look that surt and arne use. It's a nice way to use all of your colors as much as possible and add more depth to things. Speaking of colors, I feel the brown of the trees is completely unecessary unless you plan to reuse it for brown cliffs, log cabins, bridges, etc. Removing it makes almost no difference. Also, I'd break up the outlines of your deserts a bit. You don't have to be this extreme, but try to work with diagonally-shaped corners to smooth things out a bit. Firstly, the dither in the trees-- that's not a good idea. It produces ugly "crawling" patterns on a CRT. Perhaps try some more "organic" pixel groups? I don't have much to say about the sprites. They look pretty good! @Marscaleb -- these look really great! The background tiles' style makes me think of Destiny of an Emperor, Rampart (Japanese release), and Hydlide. The sprites are cute and have a friendly, almost "chibi-like" feel to them. - The red-headed character whose hair has a part in it -- the cut-away for the parting of the hair that shifts/moves looks tacky/out of place. It took me a moment to figure out why: all the other characters' heads/hair don't have animation on them (except for the very bottom/last character, a knight I guess). I'd suggest simply not having the cut-away/part animate, just keep the hair statically in place (no animation). - Same red-headed character: from the front and sides this character has what I believe to be a belt or possibly cord (monk?). However, the view from behind depicts no belt/cord. I definitely like the belt/cord visual, it adds flavour and character (esp. if it's a monk character), so don't get rid of it. :-) Maybe he has a cape or overcoat on? - The character with the grey helmet doesn't look particularly good when facing downward. I can't decide if it's the shape, the colour, or how it "conflicts" with his eyes (being so close to them). I'd have to see what this looks like with NTSC effects on it, maybe it looks better there. These are *really* nice, man! A step above most overworld tiles on the NES, but they look like they'd fit right in on any JPRG. Thanks! I originally wanted to make something very close to Dragon Warrior, with its extremely blocky appearance. But long story short I decided to make something a bit more natural. Now I'm *kinda* fighting between the two schools. But JRPG is definitely what I'm leaning toward. Ooh, that looks so good, I can't really argue with results. Hm? I was under the impression that dithering on a CRT blended the pixels into simulating a new color. I've heard that mentioned a few times on this forum, and have seen a number of examples showing this. Ah! That does look more like what I was trying to go for! I've been having a hard time creating am alternate version of those mountains; I will try that. Thank you! - The red-headed character whose hair has a part in it -- the cut-away for the parting of the hair that shifts/moves looks tacky/out of place. [...] I'd suggest simply not having the cut-away/part animate, just keep the hair statically in place (no animation). Yeah, I was starting to think that once I saw it animating. But it was one (of several) things that I wanted to see if other people thought it looked wrong, or if it was just me. - Same red-headed character: from the front and sides this character has what I believe to be a belt or possibly cord (monk?). However, the view from behind depicts no belt/cord. Oh! I missed that; thank you! Yeah, I can't for the life of me get the helmet to look right. I tried about everything I could think of, but it never came out right. 16x16 with just three colors is HAAAAAARD. 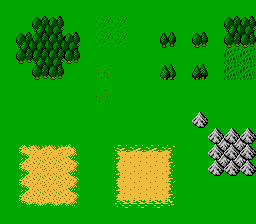 Others have spoken well about the overworld, as for sprites, I would try to outline a lot less, especially the very top and bottom outlines. With one pixel above the head, one below the chin, one below the shirt, and one below the foot, 25% (4/16 pixels) of your height is being devoted to outlines. His examples use more colors, but the theory can still be applied to NES style work, and he does so in some of his other work elsewhere on his site. as for sprites, I would try to outline a lot less, especially the very top and bottom outlines. With one pixel above the head, one below the chin, one below the shirt, and one below the foot, 25% (4/16 pixels) of your height is being devoted to outlines. That's the kind of thing I would do if I actually knew how to make good art. I am not a fan of dithering, but Alp has hit this point far better than I ever could. I wanted to comment that the mountains don't at all seem connected to the flat lands, they're very out of place. It probably comes from the harsh black outlines. I'd love to see what else can be done without the outlines. That kind of stuff crops up into my art a lot too. I hope a lot of very talented artists post their edits in here, particularly of the characters. I dream of being able to make organically lit sprites, stuff that makes use of 3 colors half as well as the gameboy Zelda titles. I think the chubbiness looks good. It's his style. I guess you have tried to round the helmet in the forehead? If nothing works you could maybe try making it flat from the side and maybe from the back as well and see how it looks. I didn't try it myself, I'm just guessing what I would try to do. I noticed the side-view walking animations looks like they are skiding forward. One thing you could try, in order to make the walking animations more exagerated, is to make bopping of the body up and down for the side-view walking animations. For example if they have normal tallness when standing still, you can draw the bodies one pixel shorter when taking a step, and at the same time make the feet a bit more apart. If you look at the bottom of arne's Zelda page, you'll see what I'm talking about. Also, you can see the technique throughout his awesome Famicube page. When it comes to pixel art, I'd highly recommend looking at contemporary artists instead of 30-year old sprites. Lastly: if you want to be a lazy copout use your space more efficiently, you can use recycle the bottom 16x8 of the south-walking sprite for the north-walking sprite. I was going to say, lower set eyes and more visible scalp, due to perspective, could improve them too. You seemed to have addressed both as well. Thank you! This is something that I was looking for! Well these characters were intentionally supposed to be generic; I decided to start with the "common townspeople" sort of characters before I made the ones that would be important named characters or player characters. The bottom left one was a first attempt at making a main character. One thing you could try, in order to make the walking animations more exagerated, is to make bopping of the body up and down for the side-view walking animations. For example if they have normal tallness when standing still, you can draw the bodies one pixel shorter when taking a step, and at the same time make the feet a bit more apart. Yeah, that was something captured in the reference sprites I followed most, but I was having too hard of a time trying to draw in such a small space without scraping off 1/16 of my canvas. Also, I'm leaning toward emulating the Dragon Warrior style of having NPCs constantly animate, even when they are just standing there. If I pursue that kind of style, it would look better if they didn't actually bob up and down. If you look at the bottom of arne's Zelda page, you'll see what I'm talking about. Oooh! Man, I find myself just wishing I could make concept art that good. Oh well, just gotta keep trying I guess. Also, you can see the technique throughout his awesome Famicube page. Ah!! i had come across that once a while back and I could never remember where to find it! Thank you, I've been looking for that! Yes; I've been seeing that in a few examples, like in what Alp and DragonDePlatino have done. When I get around to it I certainly want to try making my characters look like that.